We offer a ​free in-person consultation to discuss your case. Abe and Demijan joined together to form Matthew and Drnovsek Law, LLC in 2013. Immediately prior to the partnership Abe ran a family law practice handling child support, child custody, and divorce matters. Demijan ran his own personal injury practice handling all criminal matters including car accident, slip/fall injury, workers compensation and nursing home neglect. 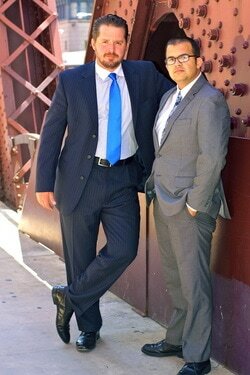 Abe and Demijan decided to combine their law practices and use their cumulative abilities to best serve their clients. Abe’s prior employment at an established personal injury firm in downtown Chicago involved servicing clients with auto, medical malpractice, workers compensation and premises liability cases. At the same time, Demijan was working at a general practice handling negligence, nursing home and dog bite cases. Demijan also prosecuted misdemeanors, domestic violence, and traffic cases at the Will County State’s Attorney’s office. In the 4 years since opening, MDLaw has represented over 300 clients in family law matters ranging from multi-million dollar marital estates to highly contested custody battles. MDLaw has successfully obtained millions of dollars in judgments and settlements for 200+ injury related clients in car accidents, slip falls, workers compensation and nursing home cases. Call MD Law today for a Free Consultation!